which are also said to have originally been Bs that were later turned into firesteels. Demetrio-2 Paleologo, the petitioner, had held land on Cyprus, inherited from his father Zuanne-2, worth 5,000 scudi, and commanded 60 stratioti for Venice. During the Ottoman assault on Cyprus that began in 1570, he lost his land, saw his father and brother killed, his house destroyed, and the women of the household raped. He himself was chained at the oars on Turkish galleys for six years. At the time of writing, he was asking to be assigned to Kefalonia or Crete as captain of stratioti, with a position appropriate to a member of his family which had lost so much in the service of Venice. Before he tells of the Cypriot disaster, he recounts this family service going back over four generations and more than a hundred years. *Andronico-1 Paleologo, because of his command and valor at the Hexamilion and Corinth in 1463, was given Kastri (Hermione) in the Argolid in 1469. He fortified it himself and brought settlers there. * Zuanne-1 Paleologo (remember this one) did no less. He had been given Stalimene (Lemnos) by his cousin, the Despot of the Morea, and was confirmed in possession by the Venetian captain-general, Alvise Loredan in the Venetian-Ottoman War (1464-1478). After that, he fought in Valachia for his brother-in-law, the Voivode Stefano, to drive out the Ottomans. In 1482 he led Greek troops in the Ferrara War, and just after that fought at Padua. * Demetrio-1 Paleologo , Zuanne's son and grandfather of Demetrio 2, our petitioner, was with the Venetians at the attacks at Metilene (Lesbos) in 1501, Santa Maura, and Kefalonia. * Andronico-2 Palaeologo, Demetrio-1's son, had been instrumental at the Ottoman siege of Nauplion in 1500 in getting food into the city which was on the verge of surrender from starvation. He and two of his cousins were killed in an ambush near Argos. * Zuanne-2 Palaeologo, also a son of Demetrio-1 and father of our petitioner, was mentioned in the second paragraph He had better fortune than his brother, and fought so well for Venice that he was knighted and given the fief on Cyprus. He was killed in the Ottoman takeover. There are a great many Palaiologos names scattered through the Venetian records, and sometimes they say they are "da Costantinople" and sometimes "da Napoli di Romania" but mostly there is no identification. So go back to Zuanne-1. Zuanne-1 held Lemnos from his cousin, the Despot of the Morea. Lemnos was an island given as appanage to members of the imperial family. Manuel II had Lemnos at one time. Demetrios Palaiologos had Lemnos for many years, until he was created Despot of Mistra. *** But despots do not grant islands, but emperors do, and the only Despot of the Morea to become emperor was Constantine. So it looks like Constantine gave his cousin Zuanne-Ioannis-John, Lemnos when he became emperor, in 1449 or so. Now, when Cyriaco of Ancona was in the Morea in 1447, he visited with a John Palaiologos who was Constantine's governor of Mani. ( Cyriaco wrote the name Iωannum Palaeologum with an omega. )**** John took Cyriaco to look at an inscription on ancient walls in a field near Oitylo where there were also cisterns and sarcophagi. This John is not found in the PLP, which is the sacred book of Byzantine names from 1261 on, but there are a great many names not found in it, and it is a starting-point, not a definitive conclusion. I am quite sure that this John Palaiologos of Mani is Zuanne-1 Palaiologos whose cousin gave him Lemnos. Constantine's cousin. Now Constantine's uncle, Theodoros I who died in 1407, is known to have had children, though not by his wife. The only reasonably-identified, and nameless, child was a daughter, known later as Fatma chatún, who was married to Sulayman, son of sultan Murad. Sulayman, briefly sultan of Edirne , was overthrown in 1411. She disappeared. Palaiologos was one of the sons of Theodoros I Palaiologos, and that is why he had status adequate to receive the island of Lemnos. John was the name of Theodoros' father. The petitioner says that Zuanne's brother-in-law Stefano was ruler of Valachia. A Stephen III ruled Moldavia from 1457-1504, and in 1471, he invaded Ottoman-ruled Vallachia in and was able to push them back. John-Zuanne-1 apparently participated in this effort, and it is somewhat confirmation of his status that he married a daughter and sister of rulers. She apparently did not have a name either. Because of the way names entwine in this family, I am also suggesting that Andronico-1 was another a son of Theodoros. Andronikos was the name of Theodoros' grandfather. I have no evidence beyond a sense of tidyness and you now have all the evidence I have. I also have a Michali Paleologo who was governor of Vassilicata (Sicyon) in 1430. Someone was selling silver jewelry for him in Venice. I don't know what to do with him. I don't know how many sons we can give Theodoros credit for but he was a governor in the territory Constantine controlled at that date. This is as far as I can go with these names, other than to recall that Constantine is the only Palaiologos we know of whom there is recorded some concern for family. * This comes from Wikipedia. I like the description but I cannot vouch for the accuracy. I would be grateful for more information and sources. ** Sathas 5: 217-219 can be downloaded here. *** Mehmed gave the income of Lemnos back to Demetrios for a while. **** Cyriaco, Diary V: 23. Dancers, based on a drawing by Cyriaco. He may have been trying to draw these Samothraki dancers. In August 1446, Cyriaco of Ancona wrote letters to his friends, Franzesco di Drapieri, and Baldassare Maruffo, the podestà* of the Genoese colony of Galata, or Pera, across the Golden Horn from Constantinople. Cyriaco's editor, Edward W. Bodnar, SJ, believes that the Maruffo letter describes a fantasy. I am not so sure. Such masques as he describes were popular back in Italy, a way for respectable women to perform in public, and a nice way to exhibit girls eligible for marriage. and continues for nine more lines. Translated, this reads: "Good Fortune. To Baldassare Maruffo, son of Baldassare, well-deserving podestà of this illustrious Genoese colony, Galata Pera, on the Thracian Bosporus . . .."
Then Cyriaco describes the long day of August 15, the feast of the Assumption of the Virgin (or the Dormition of the Theotokos) which the Genoese observed at the Galata church of St. Francis. Cyriaco himself went to services at Agia Sophia before taking the ferry to Pera to a celebration. 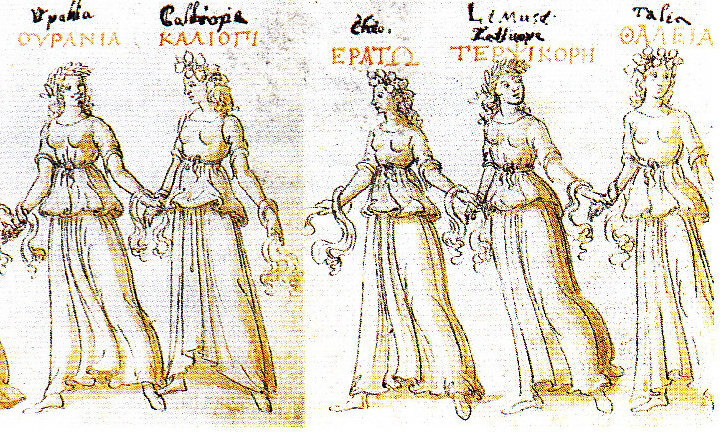 In both letters, Cyriaco wrote: "First of all, among the distinguished, celebrated golden-haired nymphs of Galata I saw your beautiful daughter (the comely, beautiful, beloved daughter of Franczesco di Drapieri, the elegant market inspector for Thrace and Asia,) Elisabetta Maria, conspicuous in gold and a cloak the color of the sky, walking just as once the chaste, quiver-bearing goddess Diana was seen gloriously leading her band." Both letters say that he saw her later in the day at the Umbriaci house with friends, relatives, and in-laws, "clothed in her father's divine, golden gifts, speaking with gracious joy during a decent (honesto) drinking party and replying to me most becomingly." Cyriaco pronounced her husband, Tomasso Spinola, most fortunate, because apparently Elisabetta Maria had been wooed by a number of highly-placed men, and a few rulers. I think Cyriaco was carried away enough to write his description of Elisabetta Maria first, and only then then describe where he had seen her, thus giving the passage the fantasy quality Bodnar identifies. Several days later, on August 21, the young Gerolimo Franchi took Cyriaco up to the top of the Galata hill -- quite a climb, really -- to the grand house of Benedetto Selvatico where "noble fellow-guests, especially eminent citizens, and colonists and their wives, as well as their married and unmarried daughters." Notice how the young women are daughters first, even if they are married. 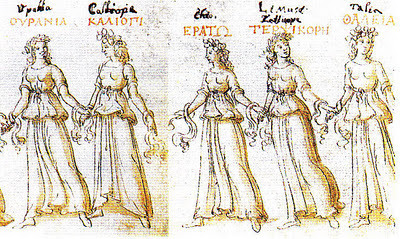 In the Maruffo letter, he writes that while he was admiring the young women and their wardrobes, he saw descending from heaven "three divine, radiant nymphs" who moved into the crowd and took on human identities. Now for a very long time, churches and stages had been able to show divine descents from heaven, and there is no reason not to think that the wealthy citizens of Galata couldn't manage the same kind of show. Particularly as the event turned out to be given in honor of Cyriaco who had been a guest of the Byzantine emperor, and who chatted with the Holy Roman Emperor, and was an agent for the Medici, and who knew absolutely everyone. The first nymph, Pohyhymnia, became Lisabella Selvatico, "an upright, modest, and most charming widow dressed in a dark-blue cloak and wearing a snowy-white veil." She began a public address to Cyriaco, describing the grandeur and history of Genoese colonies -- something with which Cyriaco was familiar. There was nothing unusual about a woman's giving a formal public address. Battista Malatesta de Montefeltro gave one to a visiting pope, and in Latin. Cyriaco writes in Latin anyway, so it is not clear whether Lisabella was declaiming in Latin. When Lisabella-Polyhymnia finished, Urania became the "deeply modest maiden" Moisetta Catania," radiant in white. She spoke about the emblems of Genoese triumph: weapons collected in battle, bolts of gates, beaks of ships, a great bowl of green stone from Syria, the body of St. John the Baptist (except for the head), and then moved to a discussion of the decay of contemporary Genoese in comparison to their ancestors' nobility. This does sound quite unlikely and certainly contributes to a judgement of fantasy. "I heard a voice from heaven saying to him, 'Alas, flee the weakness of the Thracians' land. Flee this rapacious shore and its citizens, no longer Genoese, but degenerates, leave them behind, colonists in a barbarous, motley land . . ..'"
That is where the document ends. It is difficult to know what to think. How likely is it that Cyriaco would write an imaginative theatrical performance criticizing his hosts? He did, a year later, at Mistra, write a dismal Latin poem for Constantine Palaiologos about how modern Sparta was not up to the standards of Lykourgos. Still, there was surely a party for him on the Galata hill, and a masque with those pretty daughters. The translations are mostly from Edward W. Bodnar, SJ, Cyriaco of Ancona: Later Travels (HUP, 2003). Review here. The house was looking dull, once the Christmas traces were removed and too much grey January was lurking about in corners, so we embarked on picture rehanging. Constance moved down from the stairwell and into the dining room, replacing an over-sized gloomy cathedral etching. She has simply taken over the room. It has a good story, this picture. Her father, Hector Charlesworth, was editor of the Toronto weekly Saturday Night before leaving to become director of the Canadian Radio Broadcasting Commission. Somewhere along the way he met the portrait painter Austin Shaw, and somewhere Shaw saw Constance and asked to paint her. Shaw promised to give Charlesworth the painting, but every time the topic came up, it was, "Oh, Hector, I have an exhibition coming up and I would really like to include it as one of the not-for-sale items. It's the best thing I've ever done." When Shaw died, Charlesworth had no proof of ownership and was unable to claim it from Shaw's widow who took it off to Los Angeles with the rest of the estate. Constance assumed it was lost. Then in 1961 or 62, after Constance had moved with her husband and children to Berkeley, California, she was exploring a neighborhood of less than chic "antique" shops in the area of Alcatraz and Adeline. She saw this painting in a window and reacted with something like, I had a scarf like that. Then she thought, I sewed two black extensions into it just like the ones there -- Good heavens! That's me! The next day her husband and son, Louis and Pierre went to the shop and looked at paintings, discussing loudly which would go with a putative color scheme. They finally decided the portrait would do, and were able to get it for less than $100. * Thus Constance was reunited with Constance. Pierre inherited her at his father's death. *An Austin Shaw portrait sold recently from a Toronto on-line gallery where it was priced at $3,999 CD. His work is very nearly invisible on the internet, though there is one portrait in the Ontario National Archives. of Constantine XI, which probably never happened. Becoming emperor was for Constantine, like becoming despot, a muddled and unpleasant process sabotaged by his older brothers. Consider becoming despot. Theodoros, his older brother and despot of Mistra, decided in 1427 that he wished to withdraw from ruling and enter a monastery -- never-mind that his wife was pregnant -- he had been working this idea off and on since at least 1423 and probably earlier. When John arrived with Constantine to install him as despot at Mistra, just after Christmas, Theodoros had changed his mind. The net result of this was that Constantine, with Thomas and John, managed to go out and acquire Patras, and Elis, and wives, bringing the whole Morea except for the Venetian ports, under Greek control. Theodoros hived off a great deal of his own territory in an effort to pacify Constantine, and Constantine made Sphrantzes governor of the southern territories that Mehmed would give Korkondelos Kladas in 1460. In 1436 Theodoros again decided he was finished with being despot and would prefer to be closer to Constantinople. It was noticed that he was avid to be heir to the throne. John had not been well. John sent Constantine to Mistra to take over -- he had created Constantine and Thomas despots in 1428 while in the Morea -- and Constantine went in June. Theodoros followed him on the next ship and the next thing anyone knew armies had been collected and Theodoros was briefly at war with Constantine and Thomas. John had to send two sets of clerics to Mistra to get things calmed down. Finally, in 1443, Theodoros was really finished with being despot of Mistra, and it was settled that Constantine would have Mistra and Theodoros would have the small territory of Selymbria (Silivri) just down the coast from Constantinople. Everyone knew that Theodoros wanted to be close to Constantinople. John's health was poor, and Theodoros wanted to be emperor. Everyone also knew that John, their mother Helena, and nearly everyone else but Demetrios wanted Constantine to be emperor. There was never a set sequence for the heir to the throne in Constantinople. It was usual for the reigning emperor to designate an heir, and have him crowned in advance of actual need. Manuel himself had been made co-emperor with his father over his older brother Andronikos. Then Manuel made his nephew John VII, co-emperor over his oldest son, later John VIII. Manuel was present at his son's crowing in 1421. Despite this immediate and flexible precedent, John never formally designated Constantine his heir -- he talked about it, but nothing was put on paper and there was no ceremony. It is inconceivable now that he would have been so careless in those fragile times, particularly considering how ill he was. He had nearly died from his first attack of gout in 1432, and since the Council of Union, he had never been really well. Theodoros had watched his uncle dying of gout at Mistra in 1407 and he knew what was happening with John. By the early summer of 1448 his plans were accomplished, he had made an alliance with Alfonso V of Naples who selected a Spanish bride for him. 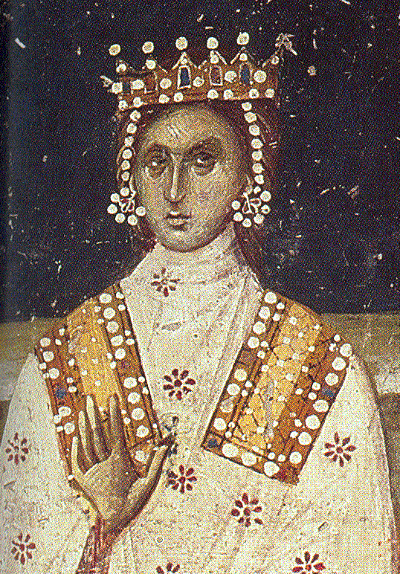 Alfonso would supply troops to take Constantinople, and once Theodoros was in place, the bride would be shipped out. Then a Catalan ship arrived in port at Selymbria and it was carrying plague. It may have been carrying troops, too, but that didn't matter. Plague spread in the city. Theodoros was advised to leave for safety, but in his usual manner he dithered. Theodoros died miserably of plague on June 21. They carried his body to Constantinople where it was buried in the Pantokrator in a night ceremony, and then his supporters -- there appear to have been quite a few -- had to figure out how to explain themselves. It was three months before there was a formal court observance of his death -- he was family: it had to be done -- but John was not present. Scholarios spoke, mostly about their collective fury at Theodoros' behavior, but still trying to do a proper eulogy. On January 6 they made him emperor -- βασιλέα πεποιήκεν, Sphrantzes writes: he wasn't there, being off on a mission from the court to ask permission of Sultan Murad II for Constantine to accept the title. There is no information as to how they made him emperor. Pseudo-Kodinos has two coronation ceremonies: what appears to be central to both is the act of anointing, and then of placing a crown on the emperor's head by the patriarch. Sphrantzes never mentions a crowning. Pseudo-Sphrantzes says "they crowned Kyr Konstantinon," implying that Philanthropenos and Iagros (both relatives) did the crowning. Two people (the emperor and the patriarch) could perform a crowning if there was to be a second emperor, such as John VIII. Something happened in Mistra, but there is no evidence for its happening in Ag. Demetrios. Did Constantine symbolically crown himself as did his grandfather, John VI Kantakuzenos? 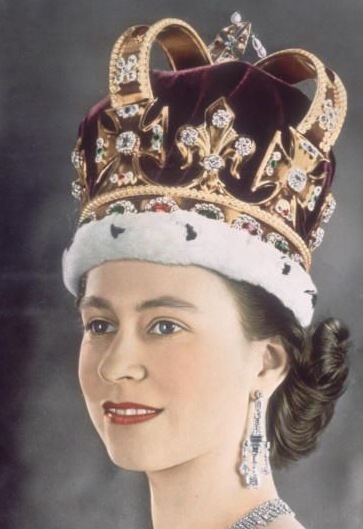 There was no official crown for the Eastern Empire, in the way that the British monarch is crowned with St. Edward's Crown. * Other emperors -- Manuel I and John VI -- who had become emperor outside the City made a point of a ceremony performed by the Patriarch when they got there. A later crowning for Constantine in Constantinople would have been very nearly impossible -- the Patriarch was a committed Unionist, Constantine was a pragmatic Unionist -- while most of the clergy, the people, and most important, the Empress Helena were in violent opposition to the idea. ** Anti-Unionist John Eugenikos, in a letter to Constantine of 1450 emphasizing his faults, wrote that he had not been crowned. There was no Greek ship to take Constantine to Constantinople. (What happened to all that famous Monemvasia shipping?) He tried to get the use of a ship from Crete, but the duca said he had to get permission from Venice. A Catalan ship appeared -- Constantine and Thomas had also been in correspondence with Alfonso V, and a bride for Constantine was also under discussion -- and the last emperor arrived in Constantinople on 12 March 1449. * I cannot remember where I acquired this information about there being no official single crown. I would be grateful for corrections, information, and sources. ** Donald M. Nicol, The Immortal Emperor, p. 37-40. When the fifteen-year old Helena Palaiologina sailed for Ragusa en route to her marriage to Lazar Branković of Serbia, she had wanted to stop at Corfú. That stop and, in fact, the whole trip seem to have provided occasion for a great deal of fuss. A committee of five nobles would meet her at Cavtat, a short sail south of Ragusa. The rettor* and the Minus** would meet her at the port. She would be led to the rettor's palace. (This was the Italian style of welcome: had she gone to Constantinople as a bride, she would have been met by the court ladies.) The ladies of Ragusa -- that would be the upper-class ladies -- would greet her in front of the church of the Virgin. Housing would be supplied for her entourage, and for the contingent that her father, Thomas, had sent by land (no word on the sizes of the entourage or contingent). Someone was to buy at Venice, for a wedding present, twenty "arms"**** of crimson velvet, and ermine to the value of 300 ducats. The bridegroom, Lazar, was to have a gift of 300 ducats worth of cloth from Mantua or Florence. Arrangements were to be made for the bride to invite the gentlewomen of Ragusa to the palace to dance, and then dine. Measures for the security of Ragusa would be taken. Thomas, Despot of the Morea, having invited the Republic of Ragusa to be represented at the wedding: Ragusa would send two nobles. This is all the information I have found, but I have questions. Presumably there were interpreters. Had Helena learned Italian from her mother? Did she have western clothes, or was she dressed as a Greek. Had Thomas ever had a party or a dance -- how was she to know how to act with these ladies she was to entertain? How long was she to stay in Ragusa before going to meet Lazar? And so on . . .
** Minus = the inner council. *** Salvadexine is also listed, but I can't discover what that might be. **** arm, braccio = cloth measurement, of about 66-68 cm. Every city had its own, slightly differing, measurement. For Venice a braccio of wool was .683m, and for silk .638m. This account is from N. Iorga. Notes et extraits pour servir l’histoire des croisades au XVe siècle. (Bucharest. 1915) 2: 416. For the picture here, I am reusing a bride who has already sat in for another young woman, there being a vast shortage of contemporary images of Byzantine brides, fifteenth-century galleys and fifteenth-century Ragusa. Contributions from readers would be appreciated.